The same friend of a friend that had asked me to make the 6" Chocolate Cake had asked me to make a 6" cake for his mom's birthday. 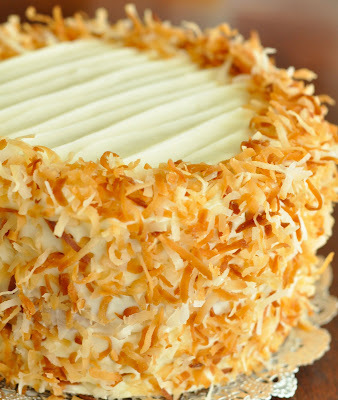 He wanted something not so sweet and I immediately thought of the coconut cupcakes I had made before. I remembered my mom liking it because it wasn't too sweet. Asians aren't too keen on super sugary desserts so I knew this one would be good. I used the recipe that I had used before for the cupcakes. One recipe was perfect for a 6" cake. For the chocolate cake I baked them off in a sheet pan but this one was a small enough batch to bake right in a 6" round cake pan. I made the cake and poured it into a "prepared cake pan." In my experience, far too often cakes stick to the pans though it might be well lubed. So, I always try to line the bottom of everything with parchment paper. 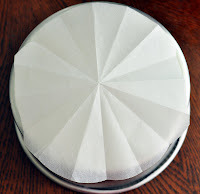 Here's a trick to getting the perfect circle for the bottom of a round cake pan. This was for the 6" cake pan. 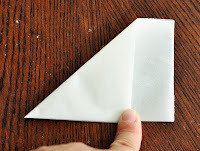 Take a 1/2 parchment paper and fold it into fourths. Cut one of the squares or whatever that's the closest to the cake pan you are using. Now fold that piece into fourths. Take one of the corners and fold it flush with the adjacent side. Take the tip of the folded paper and put it in the center of the pan. Eyeball where to cut. Snip and you should have something pretty close. You can trim it more if need be. After doing that, I sprayed the inside of the pan with a cooking spray. THEN I put the parchment circle in it so that the paper had something to stick to THEN I sprayed it one more time. After the cake comes out I take the cake round that will go underneath the cake and wrap it in plastic wrap and place it right on top of the cake. This traps in all the moisture that will escape from the cake. Some cakes like the red velvet that I make doesn't need it but this cake is more on the dry side so it needs to retain as much moisture as it can. 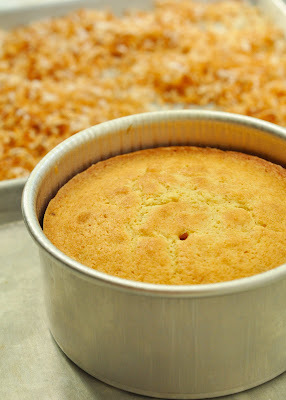 After the cake has completely cooled (may take several hours with the moisture-lock lid on) I cut the take into 3 layers. I take the same cake pan and line it with something that's called acetate. A clear plastic "paper." This will make unmolding the cake SUPER easy. 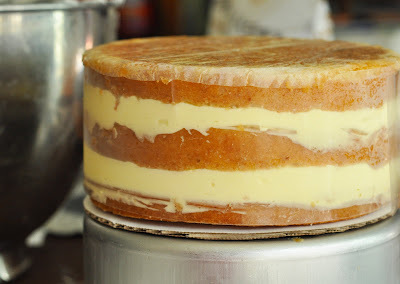 The bottom layer goes in the bottom and I filled the cake layers with a coconut cream, which is essentially a pastry cream made with coconut milk instead of regular whole milk then lightened with some heavy cream. Here's the recipe I used adapted from Dorie Greenspan's Baking: My home to yours. In a small pot heat the coconut milk. Meanwhile, place the yolks in a large mixing bowl. In another smaller bowl combine the sugar and cornstarch and mix well so that there are no lumps of cornstarch. Slowly whisk in the sugar/cornstarch mixture into the yolks. After the coconut milk starts to boil, take it off the heat and slowly pour it into the yolk mixture while whisking at the same time. After all the milk has been whisked in, pour it back into the pot and on medium heat continue to cook. It will thicken immediately. Continue whisking for about 1 minute while it's boiling. Strain into a clean bowl and let it stand for about 5 minutes. Mix in the vanilla then slowly incorporate the butter into the cream. 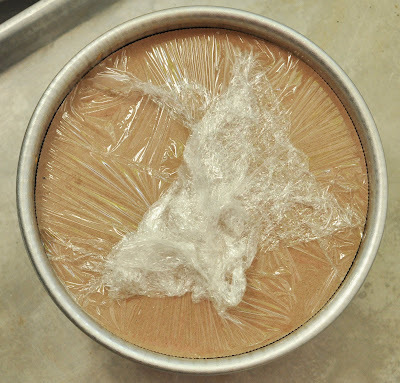 Once the butter is in cover with plastic wrap with the wrap touching all of the surface area of the cream so skin does not form. Chill in the refrigerator for a few hours or until firm. Whisk the cream to loosen it up. Whip about 1 cup of heavy cream and fold it into the cream in 2 batches. Let it chill in the fridge for a few hours and unmold. 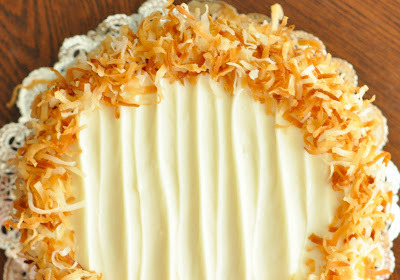 Take off the parchment and acetate and ice with cream cheese icing then cover with toasted coconuts. I got really great feedback! A beautiful cake! It loos so scrumptious! Great work! We are sisters in coconut. FB Auto Liker App is hatenablog.com functional as well as really remarkable device for Official Website Android devices and also various How to install & Download FB Liker on PC, Android Free other wise tools which could permits you to getting FB Liker much more suches as on social media sites FB Liker App status and you could get free likes on. this thirteen-piece color-coded mihanblog.com/ cooking set includes quality plastic determining spoons and also mugs, Website a mixing dish and spoon, a cake pan, adjustable Most Popular And Recommended Car Seats hat and apron and fifteen no-bake recipes.